Please note the feeds below are for the Kenya Gateway only. For feeds from other gateways, please refer to the rss feeds within your sector of interest. Internet Explorer 7 and above have built-in support for RSS Feeds. Simply click on one of the feeds above to view it. While viewing the feed you have the option to subscribe. 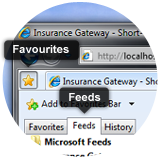 After subscribing, Internet Explorer will add a link to the feed in your favourites folder. Now, anytime you want to see a list of headlines, you can access your feeds by clicking 'Favourites', then clicking 'Feeds' - as shown in the image. Internet Explorer 6 and below do not support RSS Feeds and requires a seperate Feed Reader. We recommend using FeedReader. This is the full version. No adverts, no catches, no hidden costs! Click here to download your copy, or check out FeedReader.com for more information. Once you have installed the software, you will need to copy the link for the feed, and paste it into FeedReader. Below is a sample of the RSS Feed for the Kenya Press Room. An arrangement whereby the investments of a particular pension scheme are managed by an insurance company independently of other funds under its control.